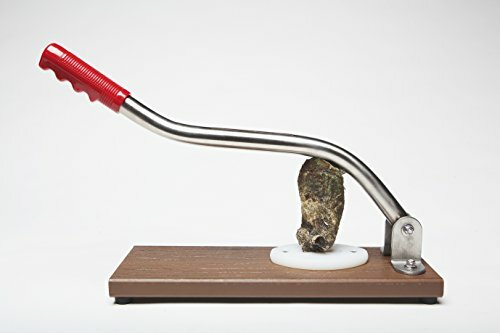 OYSTER-JACK No 7 TM is designed to open OYSTER and CLAMS in a safer, faster and more efficent manner than traditional methods when operated properly. OYSTER-JACK No 7 TM Is MADE IN THE U.S.A. And is our most affordable Oyster&Clam Shucker. Invest in America Made In The U.S.A. Portion of proceeds goes to the Disabled American Veterans and National Law Enforcement Officers Memorial Fund. All DURABLE material: Composite plastic base, stainless steel handle with all stainless steel fasteners, and food grade UHMW. Wedge is coated with one of the Hardest Metals CARBIDE for DURABILITY! Rubber feet for STABILITY. 5 year Limited Warranty- PROUDLY MADE IN THE U.S.A.